An anonymous EU official was quoted as saying that “solidarity doesn’t come for free” in relation to the Irish border issue. 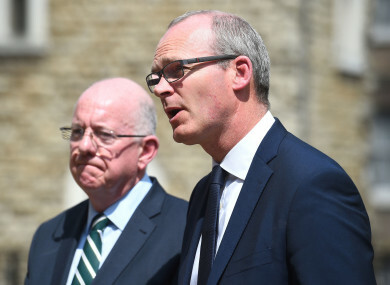 TÁNAISTE AND MINISTER for Foreign Affairs Simon Coveney said it was “verging on irresponsible journalism” to report that Ireland could have to increase its corporate tax rate in exchange for the European Union’s support on the Irish border issue. On Monday, Bloomberg reported that some EU member states could pressure Ireland to reform its low corporation tax rate of 12.5%, which has made Ireland uniquely attractive for the headquarters of multinationals such as Apple and Google. Ireland has constantly denied that its tax rate is unfair, and refused to change it; the government rebuked research that labelled Ireland as a tax haven this summer. The story in Bloomberg quoted an anonymous EU official as saying that “solidarity doesn’t come for free” in relation to support on the complex Irish border issue that has threatened to collapse Brexit talks. This morning, the Irish Independent carried the story on its front page. Coveney was being interviewed on RTÉ’s News at One when he was asked about the reports. “That is in my view, verging on irresponsible journalism quite frankly because I have spent a lot of time, as the Taoiseach has, travelling around EU capitals, ensuring that people understand why the Irish issues are so important on Brexit, why Ireland is so vulnerable and exposed to a potential bad outcome linked to Brexit. “If we don’t have a backstop in place, it could potentially create frictions that undermine the Peace Process. Those issues are serious issues. This is not some sort of bargain whereby the EU shows solidarity in exchange for putting pressure on Ireland on tax. I’m in the meetings with decision makers… there is no linkage between the two. “What happens on taxation is what has been happening on taxation for 20 years. Whereby there are some countries that want to see a more common approach towards the setting of tax rates and tax bases across the European Union. That has been there and will always been there for the foreseeable future. We have strong solidarity [on the Irish border issue] and we will ensure we keep that strong solidarity and that it’s not a quid pro quo for Irish buy in to any other policy. Coveney said that there was “absolute solidarity” with other EU member states on the importance of avoiding hard infrastructure in Ireland; EU chief negotiator Michel Barnier has listed it among his three priorities in Brexit talks. Avoiding a hard border on the island of Ireland has been the greatest stumbling block in Brexit negotiations; with neither side agreeing to the other’s proposals. The most likely options to avoid a hard border aren’t easy to swallow: the UK will have to agree to follow the EU’s custom rules and regulations; or to allow a customs ‘border’ along the Irish Sea, which UK Prime Minister Theresa May, and her Brexit Secretary Dominic Raab have said they won’t accept. The ‘backstop’ agreement is a Plan B measure to ensure that there isn’t border infrastructure on the island of Ireland. In December last year, the EU and UK agreed provisional wording for the backstop, that there would be “regulatory alignment” on the island of Ireland in the event of no other workable solution. The UK government has clarified since that this cannot mean a customs border along the Irish Sea. Tensions are rising as we approach the 19 October deadline, when a summit is scheduled for EU representatives to vote for or against the final Brexit deal, which as of yet isn’t completed. In the event of no backstop agreement, there will be no Brexit Withdrawal deal, meaning the UK will go crashing out of the EU, and (most likely) resulting in an automatic reemergence of a hard border on the island of Ireland. Email “Coveney criticises reports that EU could ask Ireland for tax reform to secure support on border issue”. Feedback on “Coveney criticises reports that EU could ask Ireland for tax reform to secure support on border issue”.